I know... you're expecting the Little River Band but that video was too long and the lyrics didn't entirely fit... just the chorus. Happy 10th Anniversary to Gudrun Erla Gisladottir! To celebrate her 10th Anniversary, Gudrun is giving gifts and prizes... but more on that at the end. Because this is "get to know Gudrun"... and because I'm a curious sort, I asked Gudrun what she missed most about Iceland and what she would miss about Minnesota. The long summer nights in Iceland where it stays light until 1:00 am in the morning... I think I would miss that too. Icelandic Lobster. Did you know that Iceland is famous for it's lobster? As in, if you travel to Iceland and you don't have lobster at least once... you must be allergic to shellfish. I was curious about the difference so I looked it up - Icelandic Lobster is smaller in size than the Maine Lobster we're most familiar with. It's also known as langoustine, and it is described as being very tender and more like an over-sized prawn or crayfish. As for what she would miss about Minnesota... she would miss the Minnesota summer and fall seasons, the Minnesota quilt shops and Target! I knew there was a reason I liked Gudrun! Oh, and she'd miss all of you. Really! 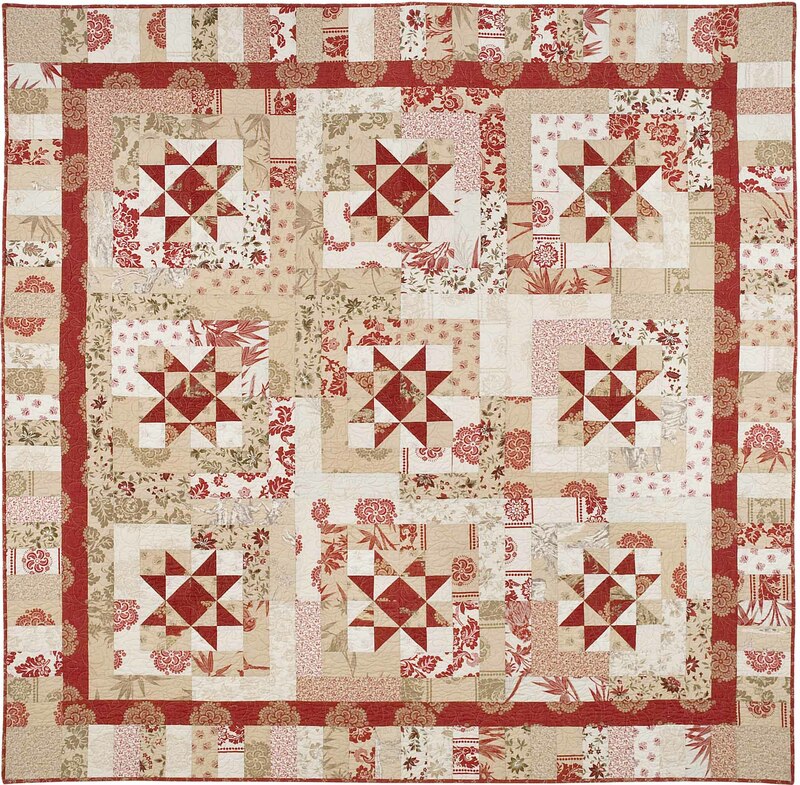 It features her most recent collection for Red Rooster Fabrics - Nordic Visions. Isn't it gorgeous? I know you're going to be surprised to learn which of Gudrun's books caught my eye because its been established that I've only ever made one single lonely little tablerunner... and it was re-designated as a wall-hanging. But I'm determined to try again so I wanted Gudrun's book, Table Talk. Yes, I will concede that the knowledge that it came with recipes was an added bonus. Patterns and books and fabric and quilts aside, my favorite thing about Gudrun is Gudrun. She's really that cool and funny and nice. While Market has never been overly conducive to really getting to spend time with people and get to know them, there are people you meet and you immediately think... "I wish she didn't live so far away because she'd be great fun to hang out with". No matter what life throws at her and her beautiful family, she's always upbeat, optimistic and genuine. And that's a pretty rare thing. So... Gudrun - Happy Anniversary and I'm really glad you're here. I would have missed not knowing you. If you leave a comment, you could win a copy of Gudrun's Table Talk book and Nordic Christmas pattern. August 11th - Pat Sloan of... well, everywhere! Hello Rosie. Hello Carrie. The info you've posted about Gudruns' name is so interesting - I love the way you're interested in words! Love your blog too, and pleased for this opportunity to win something great. Yes, I tried the dance, but at my age it was a sorry apology! Congratulations to Gudrun. Love her designs and would love to win this book. She has got fantastic designs, and a project of hers will be high on my to-do list! Great info...Thanks! The more I learn about her, the more I love-- patterns fabric books. Happy 10th and many more to come. Thanks also for the giveaway! Happy Anniversary! I enjoyed your post, so interesting. Thank you for the giveaway. Great Post! Gudrun's designs are my favorite! Thank you! Love her designs. Great giveaway. Thanks. Thanks for the great post, it was fun to read about Gudrun. I agree, she sounds like fun. Congratulations to her on 10 years! What a Happy Idea this is, to celebrate an anniversary with everyone all over the world. I love Gudrun's designs, now to look for them so I can play as well. Iceland has always been on my must see list, this has made me even more eager to visit. Thank you for all the interesting facts about names as well. I would think name tags at reunions might be a challenge. Thank you for an interesting look at Gundrun! I find the surname difference really intersting. Have a wonderful day! Happy 10 to Gudrun! What a nice post and very interesting/informative. I think I would miss a lot if I moved to a different country, but we are lucky to have Gudrun bring her talent to the U.S. I'm glad she likes it here. Happy Anniversary. Genuine people tend to gravitate to genuine people. Love you both as designers and humorists. Happy Anniversary!!! Many more!!! Beautiful work!!! Wow, did not know that about Nordic surnames. Learn something new everyday! Thanks for sharing. Congratulations on 10 years! Would love to win some of Gudruns fabrics! Thanks for the information about names, very interesting. (Still can't pronounce them :) ). Thanks for the opportunity to win. Her work is great as is yours and Miss Rosie's! Thank you for sharing Erla with us. It's nice to know more about the person, not just the quilter. I really enjoyed your tribute to Gudrun...how wonderful to have a friend like you! Also, LOVE your furry kid! We shared 16 wonderful years with our Golden girl. I'm enjoying meeting Gudrun all over the internet! Happy Anniversary! Great post! Loved all the background on Gudrun. Thanks for the blog hop. Have a great day! Opening your blogpost for GE's 10th anniversary with Fred and Barnie is AWEsome! Thanks for the flashback to my childhood! I've gotta start following your blog regularly - you're hilarious. Enjoy your patterns as well as Gudrun's. I'm so impressed with your creativity. Thanks for sharing all the interesting information about Gudrun. I think her quilts and fabrics are gorgeous. Thanks for the chance to win! Enjoyed reading about Iceland and can see her heritage reflected in her new line of fabric. The Big Blocks.... book is also on my radar. Thank you for the giveaway. Happy anniversary to Gudrun! And it's great to see you posting, Carrie. Love your blog and miss your witty stories! Love the Big Blocks - Big Style book. And you're right, that hexie quilt is fabulous. Great giveaway, happy 10-year anniversary, Gudrun. I always enjoy reading your blog. Happy Anniversary, Gudrun. Wonderful giveaway! Please keep the joy in quilting...it ceetainly is rubbing off! This has been a fun blog hop as I'm meeting new designers. Thanks for the chance to win one of Gudrun's books. Enjoyed your post about Gudrun. Thanks for the early morning entertainment. Happy Anniversary to Gudrun. We are all glad she's such a great designer & has picked all of you to share this week with her! Great way to start my morning-reading one of your blog posts! Thanks for the chance to sew a GE design. I've made 2 of Gudrun's table runners and love them. Nordic Christmas would be so much fun and a challenge, too! Such an awesome give away! Congrats Gudrun! I'm enjoying the blog hop and find the family names interesting. The Nordic Christmas book and GE Designs are wonderful. What a great post, thanks for helping us get to know her!! What a great blog hop! I love table runners, such a quick and easy project and a great gift item. (Help! I can't get that 'Happy Anniversary' song out of my head!). Thanks for the chance to win! Happy Anniversary! I'd love to win the yummy pack of fabrics. And the table runners look lovely. Gudrun was a guest speaker at my local quilt guild last year. She gave a wonderful presentation. Unfortunately I could not attend the workshop she gave the next day, I would have like to get to know her better. I have been following her blog since then. I follow yours, too, Carrie. Both of you are great sources of inspiration. Love your stuff. Happy Anniversary! I'm so glad you have this blog hop. You should be so proud of you accomplishments. We sure benefit from what you've done. You are very special! Lots of cool information about Gudrun, she is a neat lady. Her books, patterns and fabric - happy stuff! All the best to her. What a sweet post about a wonderfully creative woman! Her designs are fresh and inspiring! I would miss her too! Happy Anniversary to Gudrun! I knew there was something familiar about you when I first started following you...it's your Minnesota connection! Thanks for sharing, Carrie! What an interesting blog post - fascinating! And the Flintstones' anniversary song is my "go-to tune" every August 16th on my wedding anniversary - loved seeing that clip again. Thanks for the fun and for the chance to win! A Flintstone Anniversary tune is just the thing to liven things up at a party. Well done. Very interesting post. I love the history of words and names and I had never heard any of this before. Great to get a little background info on the designer too. Her book looks interesting, and I'll be watching for it in my travels. Congratulations to Gudrun! I just love her designs and would absolutely love to win her book!